On Saturday I shattered the screen of my iPhone. On Sunday I lost my entire wallet. And now it’s Monday. Broken phone + no wallet + Monday= the trifecta of unhappiness. I am less than enthused to go to work this morning. 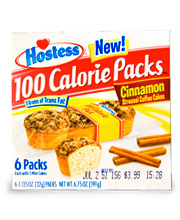 But as I was watching the Today Show this morning, sulking about the impending work day and the fact that Kathie Lee and Hoda come on an hour too late for me to catch them, I remembered something incredible: last week, I put a box of 100 calorie Cinnamon Coffee Cakes in my fridge. My day is beginning to turn around! I’m a big fan of 100 calorie packs in general– low in calories and fat, perfectly portioned, a ton of varieties– what’s not to love?! For years I’ve been loyal to the Chips Ahoy 100 cal pack, but last winter I discovered Cinnamon Coffee Cakes, and I haven’t looked back since. There are 3 cakes per pack, each one so small and so delicate it’s like eating a petit delicious cloud. They are lovely. The Cinnamon Coffee Cakes are sweet and they work great as an afternoon snack, but this is a very versatile treat. I ate a pack this morning while waiting for Al Roker to inform me whether or not I needed to wear a jacket today, and it was a wonderfully surprising breakfast! Just throw a pack in your bag and you’re good to go! I suppose most people store coffee cakes in their kitchen at room temperature, but a friend of mine once shared with me the trick of keeping 100 cal coffee cakes in my fridge. A cold coffee cake is a whole new kind of snack, but these coffee cakes are good any time of day, at any temperature! Posted on Monday, November, 7, 2011, in Dessert, Frozen, Sweet and tagged 100 Calorie Pack, Al Roker, Cake, Crumb Cake, low-calorie snack, The Today Show. Bookmark the permalink. Leave a comment.